Your wedding venue is extremely important – not just because it’s the actual space where your wedding will happen, but also because it’s one of those wedding elements that has the power to change everything: the size of your wedding, the style, and how you plan the details of the Big Day as well. 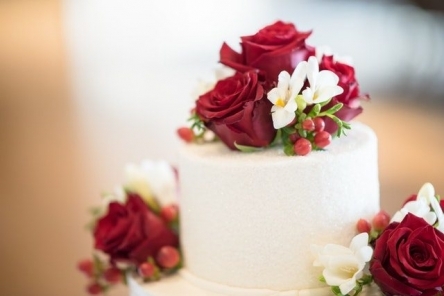 For instance, have you considered coordinating your wedding cake with your venue’s style? We have some tips for you – so read on and find out more. Garden wedding venue. If you want to plan an outdoor wedding surrounded by pure beauty and grace in a garden, you should definitely coordinate your entire wedding theme with the location. The best way to bring a cake into a garden wedding theme is by using plenty of greenery and flowers to decorate it. A simple white cake will look stunning with leaves and flowers on it, and so will a colored wedding cake adorned with flower petals in the same colors. Vineyard wedding venue. Want to plan a wedding in a vineyard? It can turn out really beautiful indeed, especially if you make sure to match your décor with the landscape surrounding you. For a wedding cake inspired by vineyards, use dark-colored fresh fruit for the décor. For instance, a cake decorated with figs will look luxurious and generous, just like the fruit and the wine born in a vineyard. Elegant wedding venue. If you are among the brides and grooms who want to have a classic wedding in a more traditional wedding space, your cake should reflect this. A marble-themed cake can look stunning for this kind of events, and so can a wedding cake that features intricate painted décor on a fondant icing. Mountain wedding venue. You can use the aforementioned ideas for a mountain wedding as well. For an even more “mountain-like” vibe, keep the florals to a minimum. Twigs, wooden elements, fallen leaves (for an autumn wedding) – these are some of the best and most beautiful ways to decorate a wedding cake for a mountain venue. Looking for a splendid mountain wedding venue in Sevierville? Contact Bluff Mountain Inn and come see what we can offer – we guarantee you will love this place from the very first minute you set foot here!